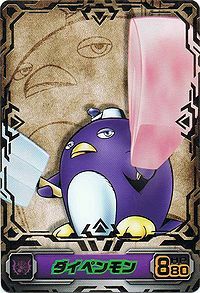 A Digimon that possesses power over Ice that has transcended legend by inheriting all the might of one of the legendary Ten Warriors and acquiring unknown abilities. 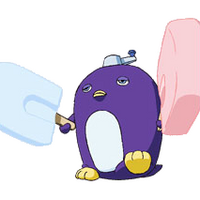 Although its wings have degenerated, by flapping the gigantic "Kakikaki-kun" hunk of ice held in its right hand and the "Kochikochi-kun" held in its left, it seems it can momentarily fly in the air. 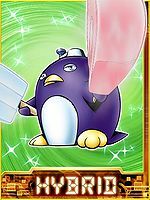 It's free from care because it is able to manufacture the Kakikaki-kun and the Kochikochi-kun on its own even if they melt away. Its Special Moves are dipping the Kakikaki-kun from its right hand in blue syrup, then striking the opponent (Blue Hawaii Death), and dipping the Kochikochi-kun from its left hand in red syrup, then striking the opponent (Ichigo Death). Furthermore, there seems to be no difference in the offensive abilities of the dipped syrup colors. Title: 「氷の融合闘士」 — "Fused Warrior of Ice"
| Dai (大) means "giant". 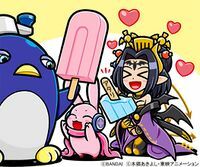 | Pen is short for penguin. 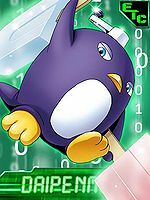 Anime/Manga Digimon Xros Wars: "Taiki, Become a Knight!" 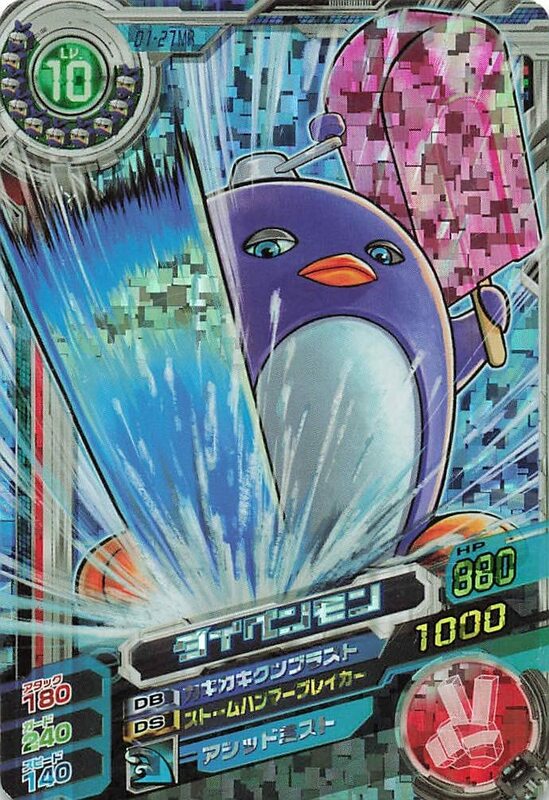 Dips the Kochikochi-kun in its left hand in red syrup, then strikes the opponent. 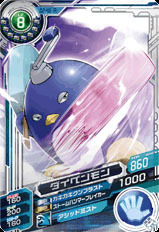 Freezes the opponent with a blow from its Kochikochi-kun. 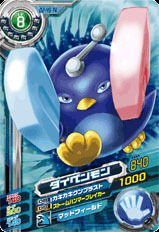 ブルーハワイデス Burū Hawai Desu Song of Thunder Dips the Kakikaki-kun in its right hand in blue syrup, then strikes the opponent. A powerful attack it unleashes on Gomamon X-Antibody's behalf. Daipenmon is a member of the Bagra Army and was trapped deep within the icy caverns of the Lake Zone. 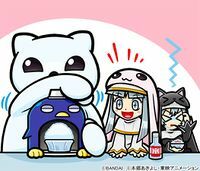 One Daipenmon is seen after Quartzmon was defeated. 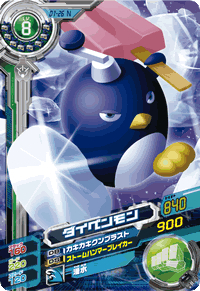 Daipenmon is available as a Digimon Medal. Daipenmon is the partner of Himi Tomoki. 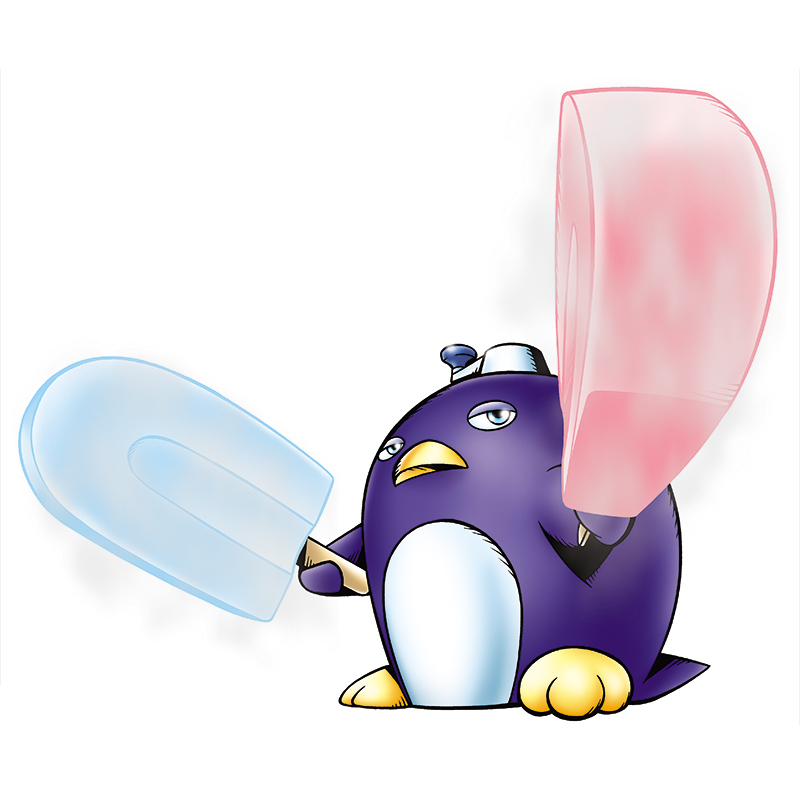 This fused ice machine exterminates enemy armies with its colorful, giant ice blocks! 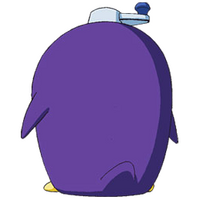 A Digimon that hides within itself tremendous ice power. 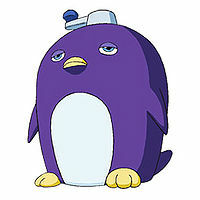 It caused Taiki's group to suffer under its super-low temperature cold air. 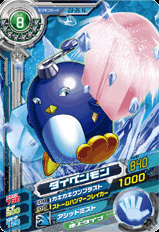 A legendary Digimon of ice that appeared before team Xros Heart. With its power, it can freeze its surroundings in an instant. A secret weapon that Lilithmon unleashed during the battle in Lake Zone. It combined with Ice Devimon and powered up. 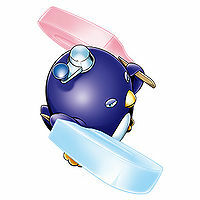 Also referred to as a legendary Digimon of ice, Team Xros Heart suffered under its specialty high-intensity freezing attack. 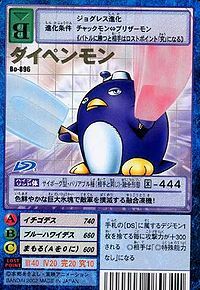 A legendary Digimon that was sealed within ice. 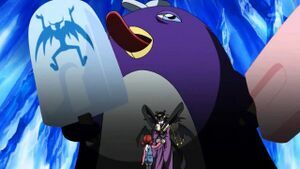 It was freed from its seal by Lilithmon, and proceeded to attack Shoutmon and its friends. 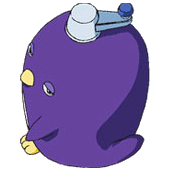 Daipenmon is an enemy Digimon in the Tactimon challenge. ↑ Super Digica Taisen: "Second Act Enemy General Tactimon Appears!" This page was last modified on 22 March 2019, at 21:07.